From left, CPT Sung Chung, CPT Christopher G. Montes, Los Angeles Board of Airport Commissioners Vice-President Valeria Velasco, Bob Hope USO President Bob Kurkjian, Delta Air Lines Managing Director of Government Affairs Dana Debel, Master Chief Petty Officer Lloyd Roberts, Wayne Kauffman, Bob Hope USO Board Member, and Noe G. Aguirre,1st Vice Commander Post 283 were on hand to mark Bob Hope USO's move into its new home at the Theme Building at LAX on Friday morning. (Los Angeles, CA) Bob Hope USO at Los Angeles International Airport (LAX) has a new address today, after moving earlier this morning into the ground level of the iconic Theme Building on Center Way. 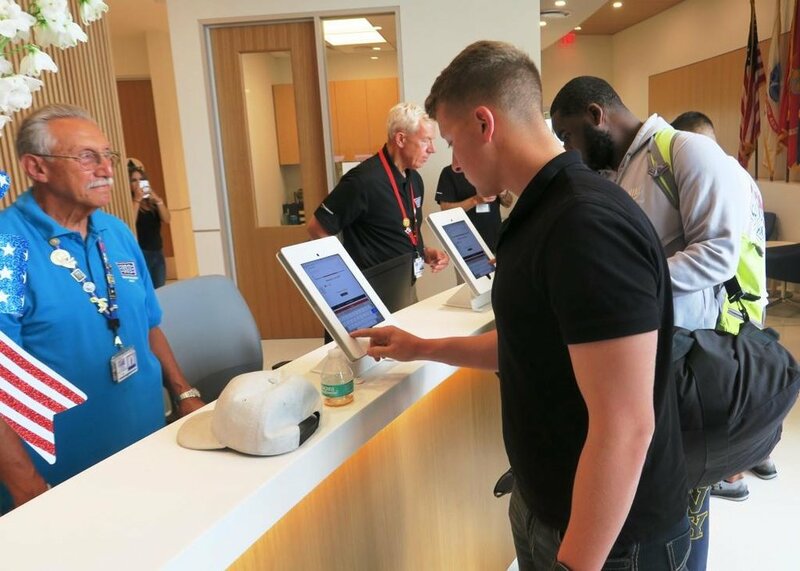 The new center is about double the size of the previous USO facility located near Terminal 2, providing 7,100 square feet to serve current members of the military and their families traveling through LAX. Some of the first service members to arrive at the new USO location register on Friday morning. "For 77 years, the USO has been the standard bearer in service to our troops and their families," said Bob Kurkjian, President, Bob Hope USO. "Today, we continue that tradition with the newest Bob Hope USO Center, combining our tradition of hospitality with best-in-class technology and entertainment. In partnership with our major donors, this center will welcome an estimated 2.7 million troops over the next 20 years." Part of the new center pays homage to Bob Hope and his decades long support of the USO and the troops with a curated display area honoring the famed comedian and entertainer. Among the amenities for visiting troops and their families are a canteen snack bar; dining room; large nap room; family zone with play area and three private family rooms with dedicated restroom; three family video connection rooms; TV lounge and movie theater; gaming lounge; selfie wall; charging stations; secure luggage storage; and an outdoor pavilion. All services, food and beverages are provided free of charge to current members of the military and their dependent family members thanks to thousands of generous donors, large and small, and a team of over 250 USO volunteers who operate the facility 24 hours a day, seven days a week, 365 days a year. A flag bearer helped guide the first arrivals from the former USO location to the Theme Building. The USO is moving to its new location from modular buildings in use for nearly 18 years. Since beginning operations at LAX in 1974, the USO has served over a million of our troops and families. It had outgrown its existing facility, which will be removed to allow for construction of the new LAX Automated People Mover. The move and construction of the new center are made possible through the commitment of Bob Hope USO’s supporters including The Bob and Dolores Hope Foundation, Los Angeles World Airports, Delta Air Lines, Northrop Grumman Corporation, The Ahmanson Foundation, American Legion Post 283, Marilyn Cohen and Chris Malburg, Ralph M. Parsons Foundation, The Madeline and Marvin Gussman Family Foundation, Hollywood Post 43, American Legion, The Fred and Peggy Hartley Family Foundation, California Veterans Charity and other members of the community that have pledged to sponsor and support Bob Hope USO. Bob Hope USO provides direct service to over 250,000 service members, their families and eligible military retirees in Southern and Central California annually. To donate, sign up for a volunteer position, or send supplies needed to stock the new USO from the wishlist, please visit bobhopeuso.org. Bob Hope USO provides USO services and programming to members of the military and their families across 50,000 square miles of Southern and Central California. Bob Hope USO is an independent 501(c)3 non-profit organization operating under a charter from USO, Inc., providing morale and recreational services to members of the U.S. Military. Although Congressionally chartered, Bob Hope USO is not a government agency and relies entirely on contributions from patriotic Americans and philanthropic corporations and organizations. The new 7,100-square-foot center, which opened earlier today, offers nearly twice the room of the previous Bob Hope USO at LAX.